Courtesy of Hazelwood Realty Enterprises. PRICE RECENTLY REDUCED BY $25,000! BEST BUY IN STONEHENGE!!! Beautifully landscaped home on cul-de-sac features formal rooms with hardwood floors, chair rail and crown molding. Large family room with brick fireplace, gas logs, built-ins and French doors opening into a bright Florida room with a lovely view of the azalea gardens and deck. Kitchen has Corian counters and island, chair rail and large pantry. First floor master or in-law suite has full bath and walk-in closet. Upstairs master with adjoining 24×13 sitting room or gym and bath with skylight and ceramic tile. Walk-up 35×15 storage attic with silver shield encapsulation. High-efficiency heating system switches to gas when temperature drops below 37 degrees. Lifetime roof. Two-car garage + storage shed. 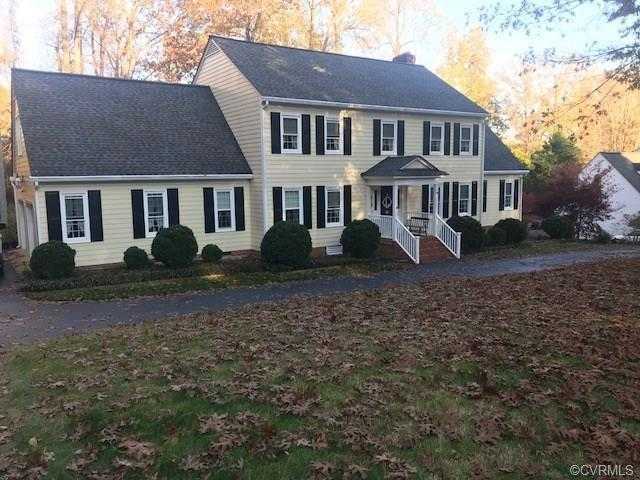 Please, send me more information on this property: MLS# 1840309 – $399,900 – 219 Bunratty Road, North Chesterfield, VA 23236.